The differences in male, female, and juvenile Ruby-throated Hummingbirds are subtle but if you know what to look for you can identify between the three fairly easily. Keep in mind that from the beginning to the middle of the hummingbird season (mid April to mid July) you won’t be seeing any juvenile birds. After the young leave the nest in July they will be considered an adult bird but with juvenile plumage. Adult male hummingbirds of course have the ruby throat but it is not always apparently red. In certain lighting or at certain angles it can appear black. Adult and juvenile females have a white throat that is sometimes marked with faint grey or buffy streaking. Juvenile males may also have a white throat like a female, but more often it is streaked to a greater or lesser degree with black or green. Tails are also a good way to tell birds apart. Adult males have a more forked tail with pointed outer feathers that are solid black. Females and juvenile males have a blunt rounded tail that is mostly black with white tips to the outer feathers. Both sexes, adult and juvenile can vary slightly in size and weight depending on the time of season however it is not uncommon for birds to almost double their weight in August and September in preparation of the fall migration. Notice the difference in the male and female tails. The male is forked where the female is blunt with white tipped feathers. Adult female Ruby-throated Hummingbird. Notice the light spotted throat compared to the male on the right. This adult female is showing off her more blunt tail with white tipped feathers. The male is more forked and lacks the white. In some lights the throat of the adult male can appear black. Juvenile male with his ruby throat beginning to come in. Visit the Warner Park Nature Center Saturday August 25th for their Hummingbird Celebration. Click here for more info on the Warner Parks Nature Center's Hummingbird Celebration. Celebrate Hummingbirds at the Warner Park Nature Center August 25th from 9:30 am to 2 pm. Ruby-throated hummingbirds are migrating South. Celebrate our smallest bird with local nurseries and other groups dedicated to conserving hummingbirds. Nashville Natives, Kona Ice, The Wood Thrush Shop and the Bellevue Branch of the Nashville Public Library will also join us to celebrate. All ages are welcome, and no registration is required. Soon hummingbirds will ramp up their interest in feeders and the action will be fast and furious. August through mid-September is peak time for us to see hummingbirds at feeders. Based on frequently asked questions at the store there's a lot of confusion surrounding Ruby-throated hummingbirds and the first few months they are here. It is true Ruby-throated hummingbirds begin migrating through and into TN as early as mid-March. This year the first reported sighting by a customer was March 30. My first sighting was April 6th. By the way, I've recorded first of spring (FOS) hummingbird sightings for over 20 years and it's always between April 3 and April 12. And the first has always been an adult male. Occasionally we here a customer say "I have all kinds of different hummingbirds" when in fact they really only have one kind, the Ruby-throated hummingbird. Only the adult male has the bright red throat while both sexes have an iridescent green back. Adult females and juvenile's look very much alike but will vary somewhat in plumage. Although all Tennessee summer resident hummingbirds are here by mid-May, most people will see very little of them, and activity at feeders will be infrequent and minimal until at least early to mid-July when there is a sudden surge. It is thought by many the reason for this sudden surge is they have just "come back" from where they've been. Actually, it is that the summer resident hummingbirds have concluded raising one or even two broods of offspring and are ready to begin taking advantage of the free nectar in the feeders you've provided. Also, the added activity is indicative of recently fledged hummingbirds beginning to understand and visit feeders. Then as we move into August hummingbirds that have been north of us, as far as Canada, will begin their migration south and stop at feeders along the way. It must be remembered hummingbirds don't travel all the way from central and south America because there are hummingbird feeders here. They DO NOT NEED the feeders but will take advantage of them when they are ready. Hummingbirds have been migrating here for thousands of years to breed and to take advantage of the abundance of insects, which is their primary food source. They would come here even if hummingbird feeders did not exist. Since hummingbirds feed on small insects there is an alternative to offering only nectar. Try placing some fruit in a mesh sack or container with holes, and hang it near your hummingbird feeder. The fruit will draw fruit flies which the hummingbirds will readily devour. It is quite interesting to see a hummingbird dart its specialized tongue out to snag the flies. Last year we introduced a new feeder called the Humm-Bug that is designed to hold fruit and draw fruit flies. Aspects high view Hummingbird feeders are some of our favorite feeders. They are easy to clean, fill, and come with a built in ant moat. The high view refers to the new perch design which is raised up compared to older models. This helps keep the feeder from obscuring the bird while perching. Hummzinger high view excel holds 16oz and has 6 ports. 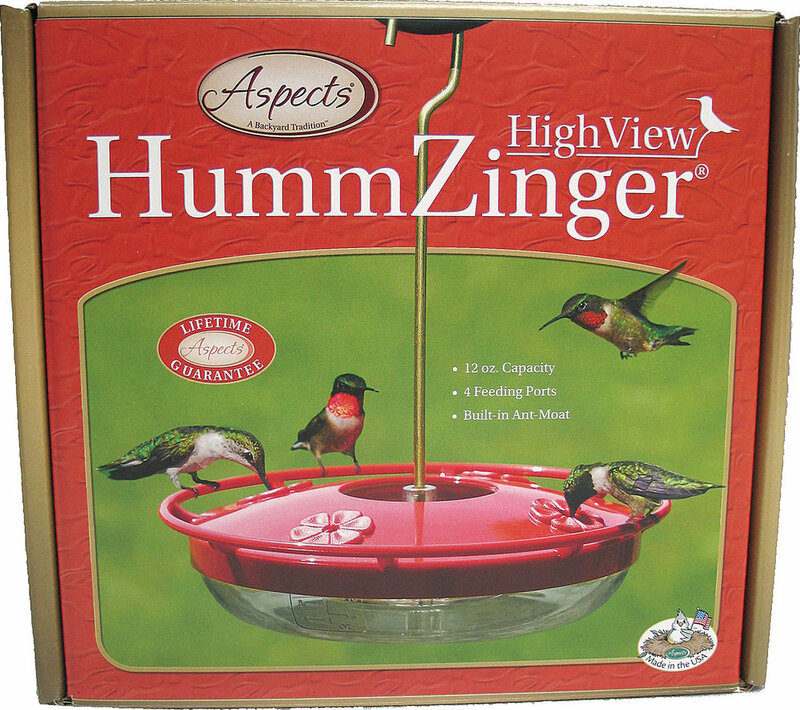 Hummzinger high view feeders come in three different sizes. 8oz, 12oz, and 16oz. Humzinger high view mini holds 8oz and has three ports. Humzinger high view holds 12oz and has four ports. A question frequently asked at The Wood Thrush Shop is “what nectar is best for hummingbirds”? The best nectar you can offer hummingbirds is a simple 1 part sugar to 4 parts water solution. It is not necessary for the water to be brought to a boil before adding sugar. The nectar is ready after the sugar has been stirred in and fully dissolved. Do not add color. Color is absolutely unnecessary and potentially harmful. 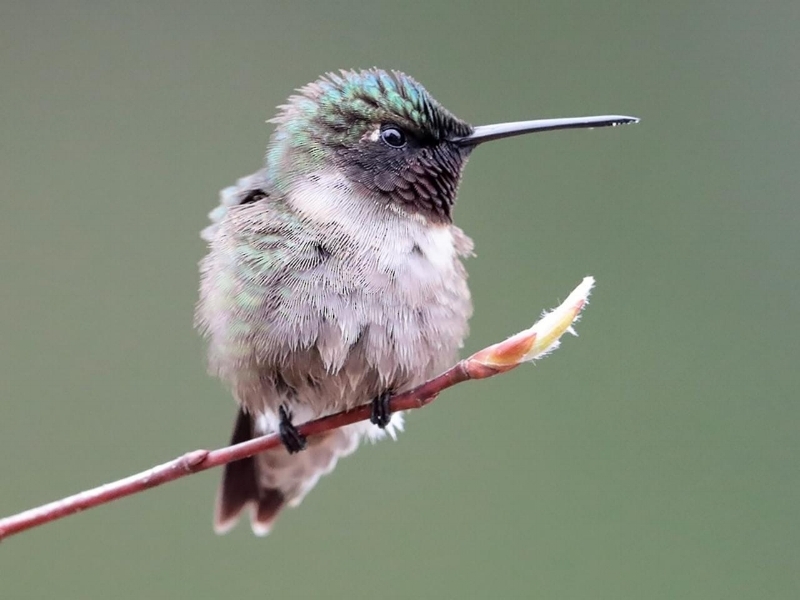 When hummingbird feeding activity is slow, like it tends to be in early spring to mid-summer, make small amounts and avoid refrigerating large quantities. Think in terms of making fresh nectar each week in small amounts until feeding activity becomes vigorous, like it does in the latter summer months. This is when it makes sense to make larger batches and refrigerate extra nectar. Remember, nectar in the feeder is only good for about 3 days in summer heat. Fill your feeder according to the activity level and you will waste less nectar and reduce your maintenance on the feeder. The peak time for hummingbird feeding activity typically starts mid-July and lasts through September, and even into October. 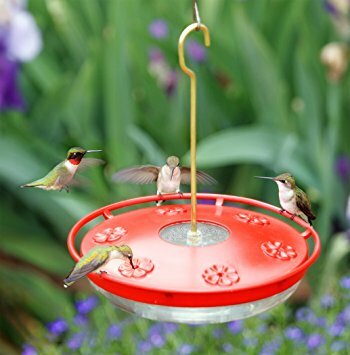 So, if you’ve been disappointed and concerned because you haven’t seen much of hummingbirds now is the time to make sure your feeders are clean and the nectar is fresh. It’s going to get very busy! Hummingbirds have "scouts". Not really sure how this got started but likely because people would see an early arrival and then other hummers would eventually follow. There is no way an adult male Ruby-throated hummingbird would actively help or encourage others to share "his" territory. Everyone sees how territorial they are as they fight for the rights to a feeder. It is believed an adult male can and will defend a territory of up to an acre. Hummingbirds and Geese. I haven't heard this one in a long time so hopefully it has gone away for good. It was believed by some that hummingbirds would ride on the backs of larger birds, specifically geese, during migration. This does not occur. Feeders must be taken down in the fall. We still hear this one quite often. People believe that hummingbirds will not migrate in the fall if feeders are left out. Not so. It is in their DNA to migrate. Again, hummingbirds do not NEED sugar water, so why would an artificial food source keep them here? If we had to take away all food sources to make them migrate we would also have to eliminate all of the various insects they feed on. Tagged: hummingbirds, hummers, hummingbird feeder, ruby throated hummingbird, Hummingbird season, feed the birds, Feed the hummingbirds. Spring migration is in full swing which means there will be a lot of interesting birds to see if you spend a little time looking around your yard, or at any of our wonderful parks and green ways. Get your binoculars out and your ears ready because the neo-tropical migrants are passing through or arriving in middle Tennessee everyday on the way to their summer breeding areas. Warblers, Vireos, Tanagers, Swallows, Hummingbirds, and many other species are there for the viewing if you try. Early in the morning, between 6 am and 10 am are best to see some of the mentioned birds because many of them migrate at night then settle down in the mornings to feed and rest. The first Ruby-throated hummingbirds to arrive or pass through TN are just about a week away. Usually one, maybe two hummingbird feeders at this time of year is enough. Don’t bother filling your feeder to full capacity at this time as the feeders are of little interest to them this early. At your feeders expect to see the always popular Rose-breasted Grosbeaks and Indigo Buntings. Of course American Goldfinches are here in abundance year round but are now beginning to put on their bright yellow spring plumage. For daily sightings reports of migrating birds you may want to subscribe to TN bird list, or visit Tennessee Birding on Facebook. Richard Connors spring birdsong workshop is open for enrollment. This class is designed for those who have had a beginning class, or already have some basic knowledge of our birds, although beginners will be welcome. Emphasis will be on bird identification by song, "birding by ear", as well as by sight. Participants will be trained for finding and identifying birds by song, especially those colorful songsters the wood warblers, some of whom are seasonal migrants and only stay for a brief visit. Radnor Lake is the perfect place to find and study songbirds, and we will take advantage of this with instructor-led bird walks specifically for this class. First meeting: TUESDAY April 10, from 10AM – 12:00 noon, in the visitor center meeting room Radnor Lake State Natural Area, 1160 Otter Creek Rd., Nashville. Subsequent Tuesdays will begin with early bird walk. Bird walks before class starting Tuesday April 17, begins at 7:30 AM. With classroom study from 10 AM to 12 Noon. The morning walks will continue thru May 15, with the last class room session May 8th. There is a $75 fee for this 6-week class, with a portion of the fee going to Friends of Radnor Lake S.N.A. Class size limited to 20 participants. Art by Anne Goetze. This and many others will be available during this event! The Wood Thrush Shop is proud to be a sponsor of this event put together by Friends of Warner Parks and The Warner park nature center. Come celebrate the first annual Hummingbird Happy Hour. Join us on Thur. Sept 14th from 6-9pm for a beautiful evening in the Warner Parks for cocktails & hors d'oeuvres, hummingbird viewings, a Bird art/photography exhibit by Nathan Collie & Anne Goetze and live music on the patio by local well-known Jazz duet Annie Sellick & Pat Bergeson. Ticket and art sales will support the Bird Information, Research and Data (B.I.R.D) programs, keeping these programs free and available for schools, families and Park visitors. Join us and the Warner Park Nature Center staff Saturday August 26th for a day all about Hummingbirds. We will have a booth set up so stop by and and say hello.